While today's comic is about Easter eggs (maybe?) the comic itself does not contain any. And by that I mean it doesn't have any fun undocumented features. It might have real eggs. Who knows? 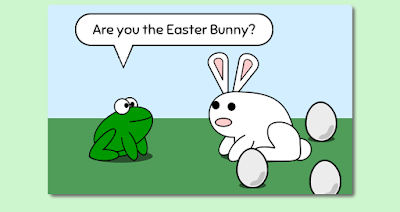 The term "Easter Egg" for an undocumented message, joke, or feature in a software product comes from the concept of the Easter Egg Hunt where children search for brightly colored eggs containing prizes. Similarly, if you find the hidden commands or whatever to unlock the Easter Egg in a software application, you get the prize. The hiding of Easter Eggs inside software dates back an Atari game from the late 1979 when the uncredited developer hid his name inside the game. It was supposedly given the name "Easter Egg" by Atari personnel after its discovery. If I'd had more time, I would have put one in the comic today. But, alas, my life is a bit of a disaster lately and I'm not even sure what day it is most of the time. I just got back from my second business trip in 3 weeks and I have a list of over 10,000 things to do before the end of the month. Okay, I'm exaggerating a little. The list is really only 9,875 things. The closest thing that Amphibian.com has to an Easter Egg is the teapot response. If you go to https://amphibian.com/teapot you will get a message indicating that your tea is ready. But if you look at the HTTP response code, it's actually in the error range - specifically a 418. That's the response to indicate "I'm a teapot" in the Hyper Text Coffee Pot Protocol. I may expand on this someday. It's not quite an Easter Egg, but there's also a way on the site to force an error condition for test purposes. It lets you see a 2-frame comic which is my lame attempt to tell you that there's been a server-side failure. You will hopefully never see it except by going to https://amphibian.com/broken. So enjoy today's comic about eggs and Easter but not really Easter but definitely eggs. Yeah.